This is an update on the very low level of complaints registered with the ABFA. These statistics include products such as invoice finance, factoring and invoice discounting. The ABFA (Asset Based Finance Association) recently became part of UK Finance. There is a process of integration to be undertaken, but in the meantime the ABFA complaints process (the ABFA Standards Framework) remains unchanged. The latest set of ABFA statistics, to the end of March 2017, shows 45 reporting member companies, and 41,971 clients serviced by these members (including a small number of import factoring, stock and ABL clients). I contacted UK Finance in order to understand the level of complaints that are being made using the ABFA complaints process, and the results are a very positive endorsement of an industry that regulates itself. The complaints process, which includes recourse to an independent Ombudsman, was established in July 2013. I reported on the low levels of complaints in the first year, but this update encompasses the period of just over 4 years since it was established. In total, the ABFA have recorded just 256 complaints over 4 years, which averages approximately 64 complaints per annum. Comparing that annual number to the number of clients (assuming that all complaints were from different users) this would mean that just c. 0.15% of clients are complaining to the ABFA each year. Of the total number of complaints recorded, only 60 resulted in escalation to the Ombudsman, of which the majority, 57% were NOT upheld. So that means that the number escalated to the Ombudsman annually is c. 15, which represents c. 0.04% of clients having their issue escalated for adjudication. On average, just over 6 complaints a year are being upheld by the independent Ombudsman - a tiny number in context of the 42K clients using the service. This shows a very low level of dissatisfaction amongst invoice finance users, which echos independent research that we conducted. We spoke to 200 existing users, across a range of different providers, and we found that 98% of existing users said that they would recommend invoice finance to other businesses. 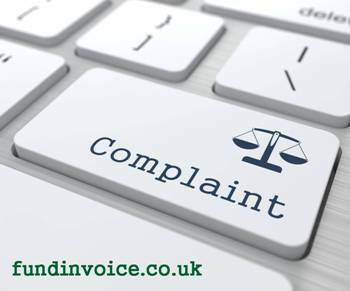 If you have an issue with your factoring company or invoice discounter, please see our complaints guidance notes for further help.